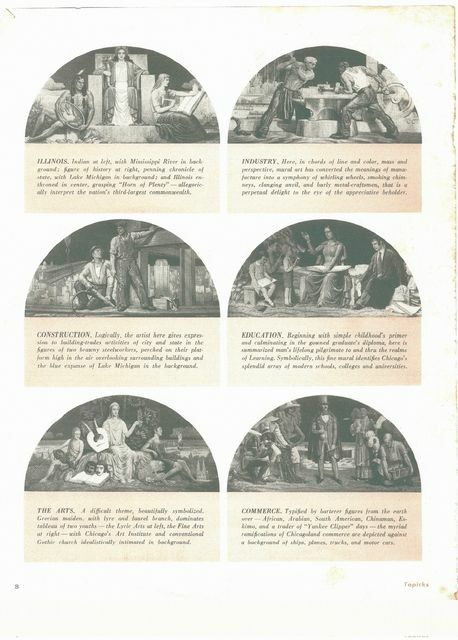 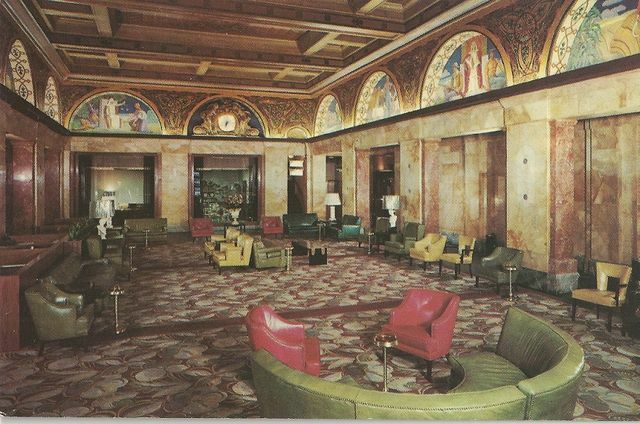 In 1940, possibly before the beginning of his professional relationship with art patron and hotel mogul Albert Pick, Jr, Louis Grell was commissioned to paint 13 murals for the lobby of the Congress Hotel to be displayed inside the lunettes. 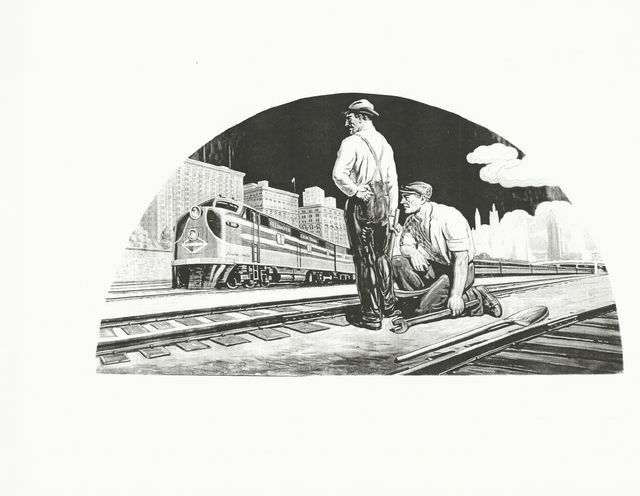 The 1940 commissions were primarily buildings and landscape scenes depicting famous locations in and around Chicago. 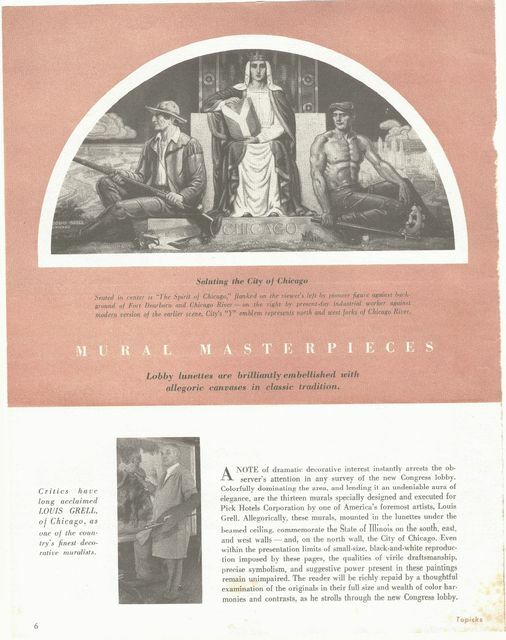 After Albert Pick acquired the famous landmark, Grell was again commissioned in 1952 to repaint the same 13 lunettes, this time, of famous people and allegorical scenes of Chicago including The Spirit of Chicago holding the “Y” tablet depicting the river that runs through the city which had to be diverted in the late 1800’s to help clean up the city. 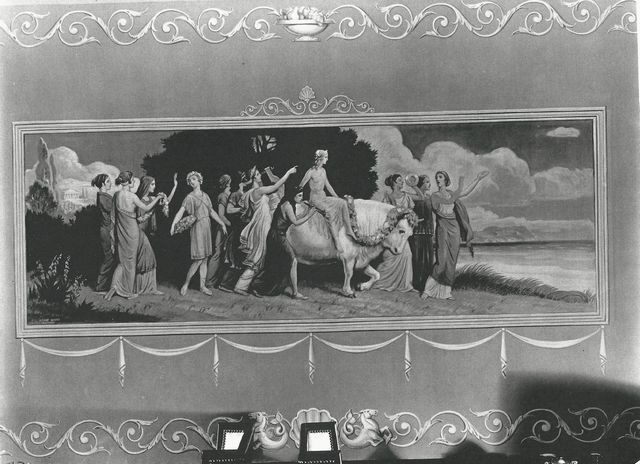 Grell was also commissioned to paint 3 large walls for the Pompeian Room in 1955, which was adjacent to Peacock Alley, and included three mythological panels and decorative designs throughout each wall. 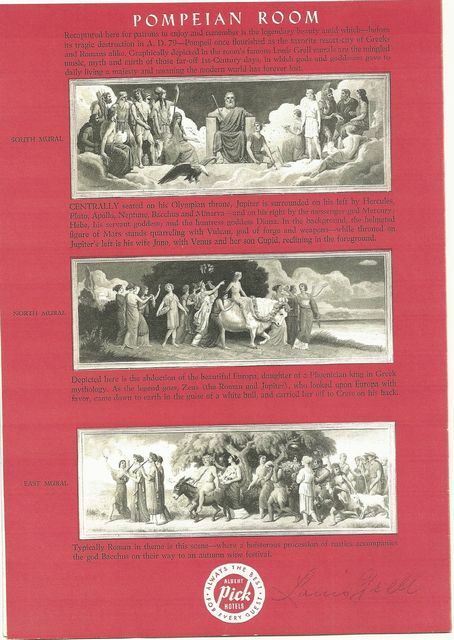 Jupiter on his throne (south wall), the Abduction of Europa (north wall) and Bacchus (east wall) scenes were rendered by Grell. 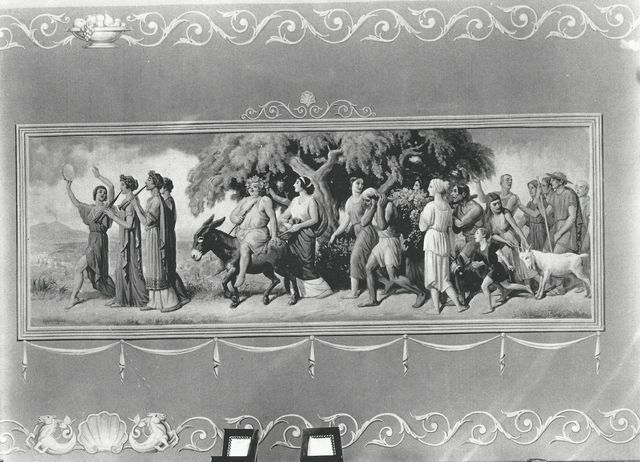 Two walls were 50 feet long, the panel of Bacchus was on a wall 26 feet long. 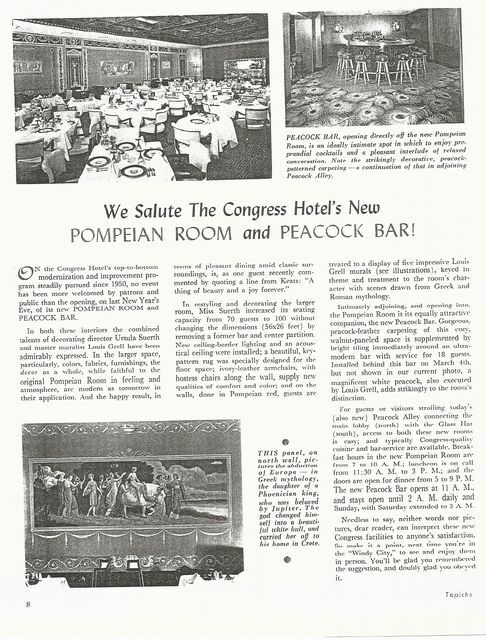 Installed on March 4, 1955, a large magnificent white Peacock executed by Grell was displayed behind the bar inside the Peacock Bar, adjacent to the Pompeian room. 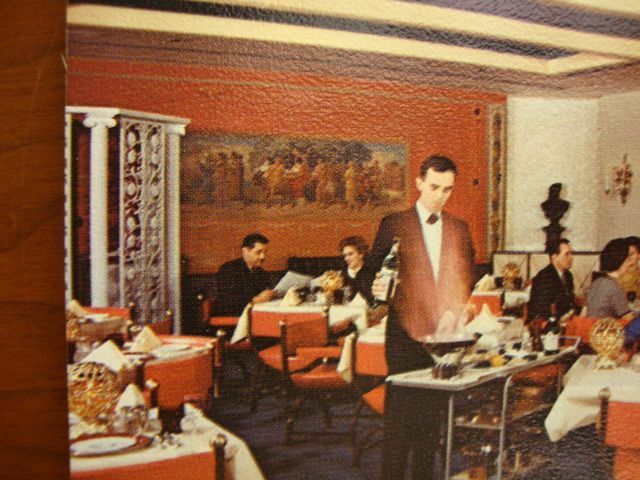 The Pompeian Room red menu is from 1955 and describes the three main murals on the reverse side, is signed by Grell and part of the Louis Grell Foundation collection of archives. 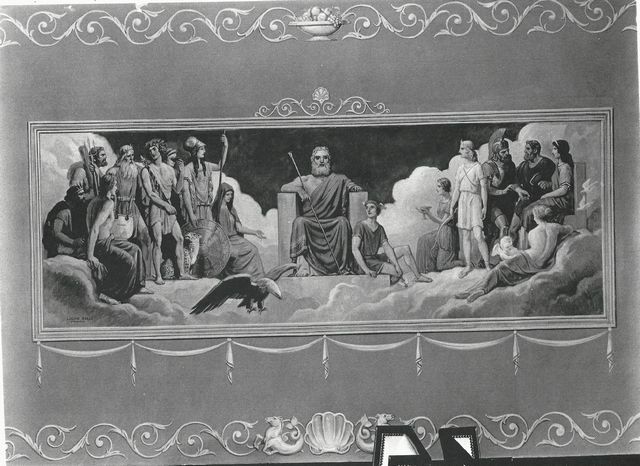 The Gold Room was decorated by Edward J. Holslag, a pupil of John LaFarge. 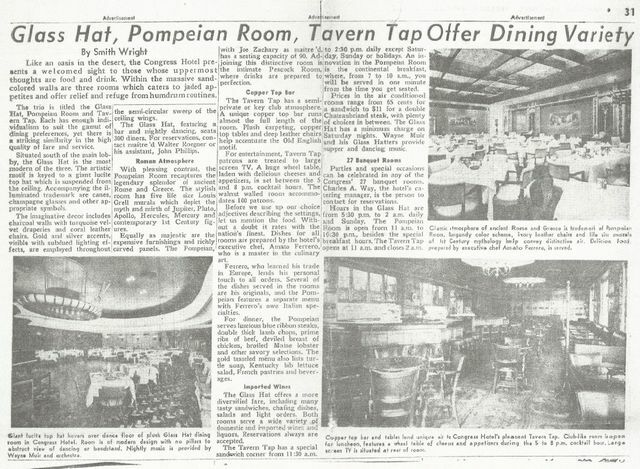 The Florentine Room was designed and painted by Grell’s longterm friend and best man in his 1922 wedding, taos artist E. Martin Hennings. 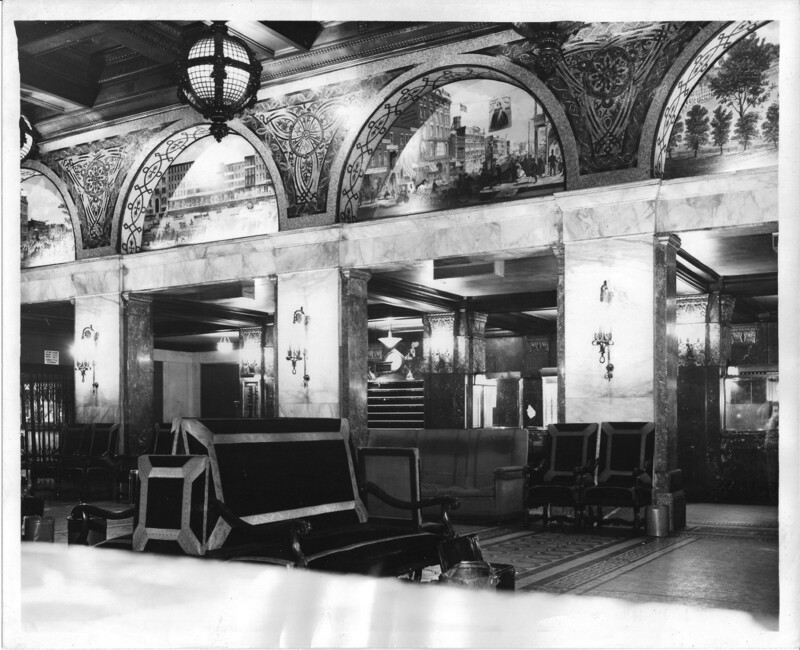 Both rooms are still preserved and can be seen today. 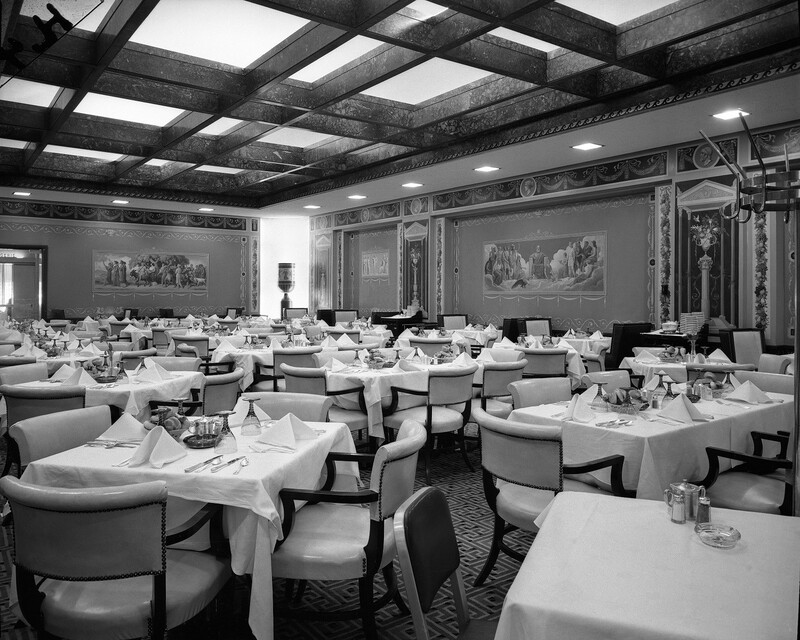 Unfortunately, the 13 lobby lunette murals have been covered by mirrors and the Pompeian Room was removed to widen the streets. 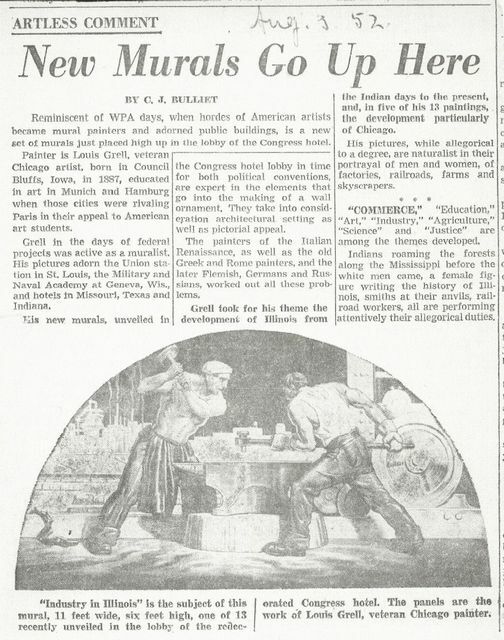 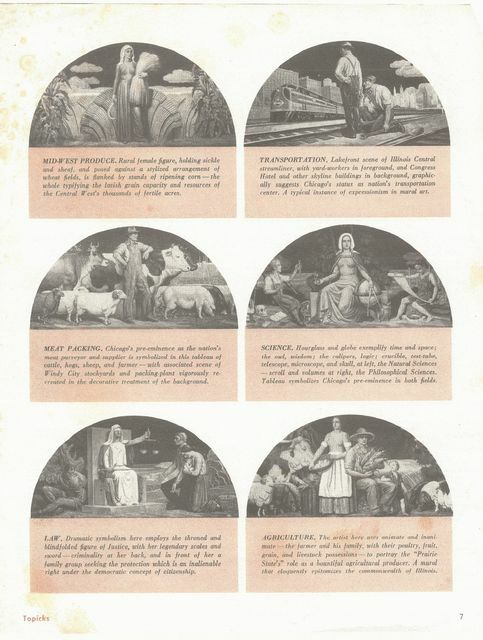 The Congress Plaza Hotel regularly held fine art exhibits of which Grell participated in a one man show in 1955. 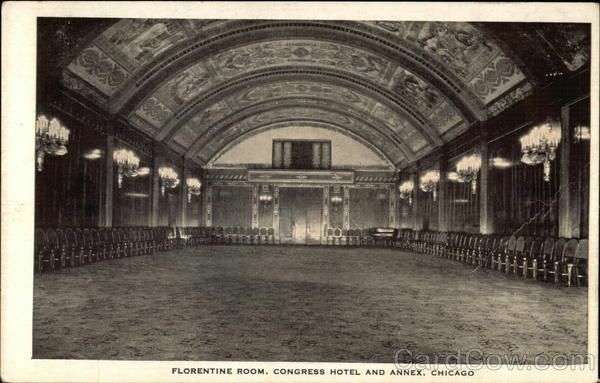 Included is a picture of the old Pompeian Room at the Congress Hotel. 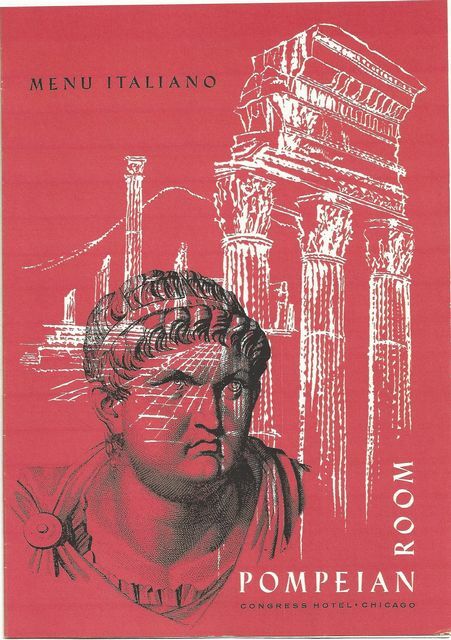 This is an enormous glass fountain depicting the eruption of the volcano that buried the ancient city of Pompeii. 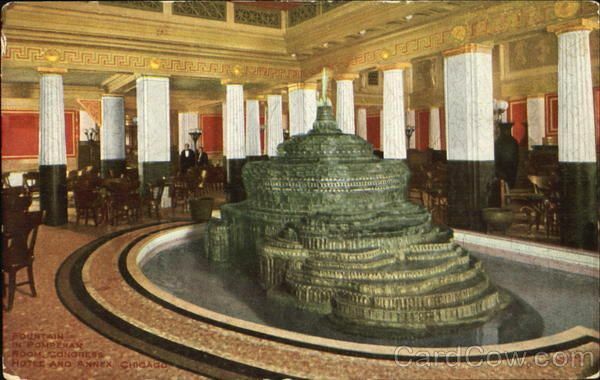 The artist is the well known Louis Comfort Tiffany (1848-1933).